IMDb makes personalized recommendations to help you discover movies and TV shows that you will love. Where can I find my personalized recommendations? Recommended titles will show under the section "Recommend For You" on the IMDb homepage. How does IMDb choose the titles in the Recommended for you feature? We take all of the movies and TV shows that you have either rated or added to your Watchlist and then compare your data to ratings made by other IMDb users. We can then find movies and TV shows that people with similar tastes to you like. For each recommendation, you can see a list of the movies or TV shows upon which the recommendation was based. You have either rated these titles highly, or added them to your Watchlist. 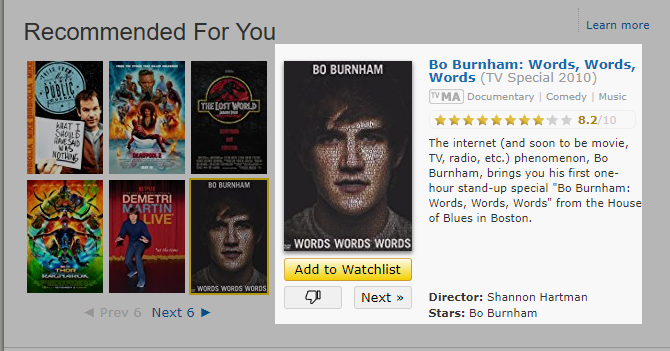 How does IMDb know what I showed interest in? When you give a movie a positive rating or add a movie to your Watchlist, we track that as a movie that you are interested in. Why do I see items in my recommendations that I've already rated? If we do not have any recommendations for you (either because you have logged out or because you have not rated many items), IMDb will show you a list of items that many people have seen so that you can enter ratings to get recommendations. How can I improve my personalized recommendations? To improve your personalized recommendations, find and rate the movies that you love. I've just rated a whole bunch of titles. How long will it take for those ratings to impact my recommendations? New ratings will have an immediate impact on your recommendations. After rating and adding titles to your Watchlist, reload the page to update your recommendations.